Things have been less than great just lately, so I have not had either the time or the energy to post anything for ages. Work's been a huge stress, Mark's not been himself, and I've been too tired and depressed to do much of anything. I'm piling on weight at an alarming rate too. Once I'm home from work, spent some time with my boy and had a glance at my emails and Facebook I hardly have the energy to drag my ever fattening body up the stairs to bed. 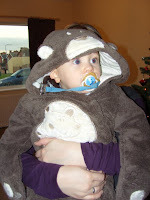 But things are looking up again now, so I am FINALLY getting round to posting some stuff about Jack's First Christmas! Christmas was great! 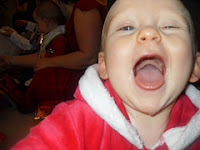 It was all change this year, with us spending Christmas Eve and Christmas Morning at my Mums! 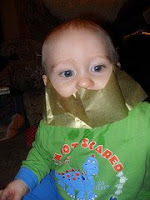 It's so long since I did that last I can't remember... (bad daughter!) 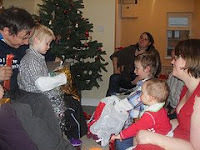 Jack had a massive pile of presents from people 'over Burnley way' which includes all of John's family too despite the fact that none of them actually LIVE in Burnley! Christmas Day we drove over to my In-Laws and stayed with Jenny, who hosted and cooked Christmas Dinner for the first time (with a bit of help from Rachel, and additional bits n bobs supplied by all members of the family, can't make the poor lass feed the 5000 on her first big do!) and I have to say it was bloody great! Jack troffed a huge plate full of Christmas dinner, including 3 Yorkshire puddings! Boxing Day we went to Kate's and had another massive feed! It's great seeing all the kiddies together. Chris & Nicky off playing together (aka fighting) with the Lego, and Jack, Alex & Megan grabbing at toys, each other and anything else they could get their tiny little hands on! Jack now officially has more toys than we have room for in the house! We've had to buy toy boxes to keep them in and rotate what he plays with on a daily basis other wide we'd never be able to take a step without breaking something, and Jack'd never get to play with them all before he grows out of them! I 0nly wish we'd been able to get a few more photos (there are more on Flickr, and other peoples shots on Facebook too) but my poor camera wound up in a cup of sweet tea and hasn't quite been the same since - I'll take it to get mended if I ever have 30 seconds free time to do it in!